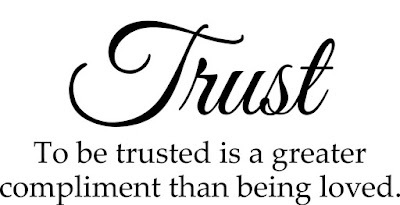 So far whatever I have heard or read about Trust, I would say I haven't encountered anyone who could completely Trust me. I mean c-o-m-p-l-e-t-e-l-y. Nor have I trusted any human completely. I am on my search for Trust, it is one of my goals in life to be achieved. Everyday when I pray, I ask for four necessities for my future, Trust is one of them. I want to meet someone Trustworthy, be it my best friend, someone I already know or any stranger. I want to experience it. I get jealous when people share their experiences related to Trust. I dislike or mostly hate people who don't Trust. Trust makes a person feel better, relaxed, empowered and happier. So TRUST tops my Goals List. Shark, you will find Trust eventually.. I hope you get a life partner who will trust you completely..
Lots of Love to you and your family..
One of my friends asked me to check this blog out as she found you to be quite similar to me... and yes you are! I have read all your posts and you seem to be just like me..hahaha..I am glad i found somone like me...and I am also searching someone I can deeply love and trust completely, i am not of your age but, i am 22 and live in Jordan..hoping both of us can find someone to trust..all the very best for everything dear.. I usually write during my mood swings and when I read my articles later I go like 'Was that me? ', so I can tell you, I am not exactly the person I am on the blog or my blog just defines a part of me. I don't write down everything about me here as I like to keep certain stuffs in my private space. I write when I am pissed, too happy, sad, bored, but nothing as such is mentioned when I am writing. I mostly write here expecting certain person or people to read. Based on the "someone to deeply love and trust" that you are talking about, I already love a lot of people but I can't trust any of them completely. Deeply loving someone, I am really scared to even have a glimpse of that zone, I hate regrets, so never mind. Yeah, obviously I do want this quality to be there in my future partner as that's maybe something that will stay till the end.